Travelers can swim with the Peruvian sea life close to Peru’s capital, Lima. Boat tours to Palomino Island set sail daily from Callao Harbour which is close to Lima. The boat tours give visitors the chance to swim with Peru’s sea lions (wetsuits provided). Lunch aboard the luxury boat is also provided. Getting there: day trips pick you up from your accommodation in Lima, Peru’s capital city. Soar through the sky with Miraflores below while paragliding in Peru! Scope out the ocean during this exhilarating ride of the Costa Verde cliffs. Revelers can also parasail or Para trike! 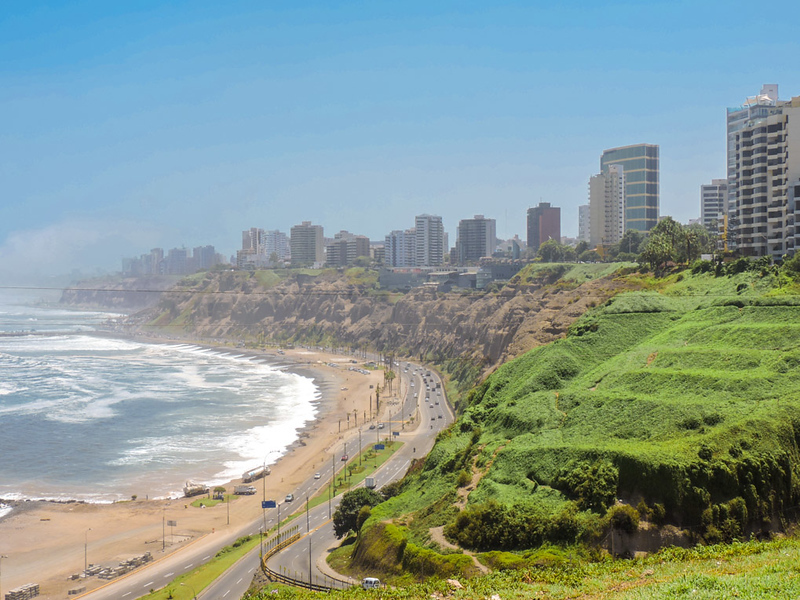 For the best views of Lima, head to the sky and float down for 10 minutes. Starting point: Lima’s Malecon – Raimondi’s Park. Heights: Between 80 and 180 meters. Limits: below 69 years old/around 90 kgs or 200 pounds. Para-triking is an adventure option for two. This activity involves wheels and engine! The trip starts 50 minutes south of Lima and is a better option for when there is a lack of wind in the city. Other activities: Love beer and food? Check out Barranco’s craft brewery for pizza and drinks. If the sky is not your adventure bag, what about the sea? Surfers congregate around Barranco’s beach aka Waikiki beach by the city. Hire a board or head to Pukana Surf School for a surf lesson at Lima’s beaches. Those committed to the sea will want to head south to Punta Hermosa where the waves average at 4 meters high. However, if you are flexible with timing you might want to head north to Mancora where the serious surfers unite. The sun, warmer waters and the party scene draw the more adventurous travelers north. It’s a little out of the way and a tad off the typical gringo trail but it’s not just surf on the menu, vegetarian food is rated highly as well as the fresh ceviche. Not into surfing? Jet skiing, paddle boarding, and 4×4 rides are also an option in Mancora. Other activities: mud baths (just outside of the town), whale watching, kitesurfing, and tanning! Paracas is where speedboat trips to Peru’s poor man’s Galapagos Island jet off. 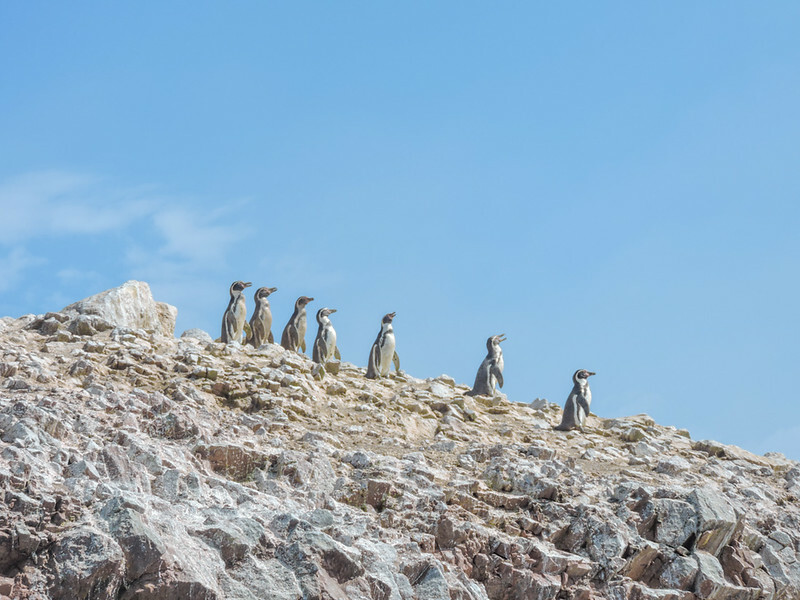 The two-hour tour of the sea takes visitors passed three islands of Islas Ballestas where you can spot baby penguins, sea lions, and even dolphins if you are lucky! What to pack: suntan lotion, a hat and cardigan/sweatshirt (it can get cold on the boat). Life jackets are provided. Note: this is not a luxury boat. Born to ride? Pick up your ATV buggy at the office in Peru and ride around Paracas National Reserve at your own leisure. Be sure to visit Playa Roja, the red beach in Peru. This striking beach has a red crust-like beach which the intense blue waters lap against. This adventure activity is only for over 18-year-olds with travel insurance for safety reasons. Where to sleep: Paracas has something for every budget from hostels with dorms (and swimming pools) and chain hotels with a spa. 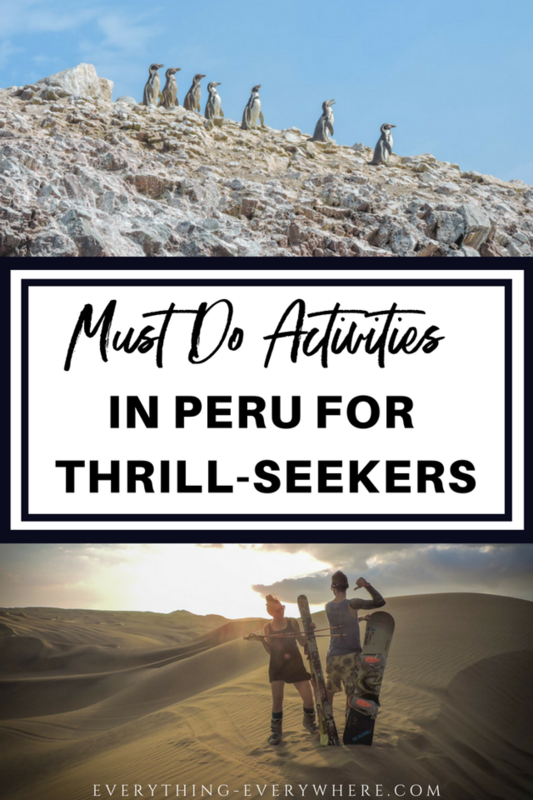 Other activities: drink Pisco Sours on one of the local restaurant balconies as you watch the world go by. 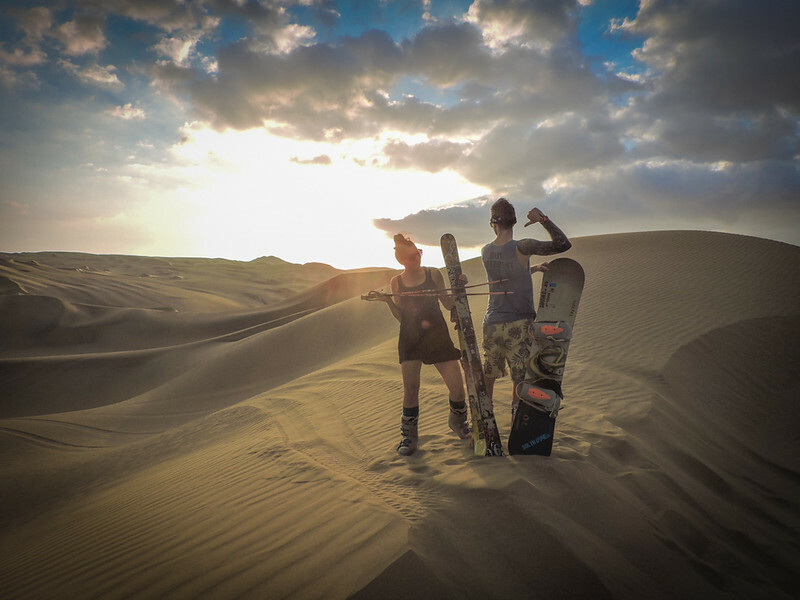 Yes, there are sand dunes in Peru! Ever slept in an oasis? You can in Peru. 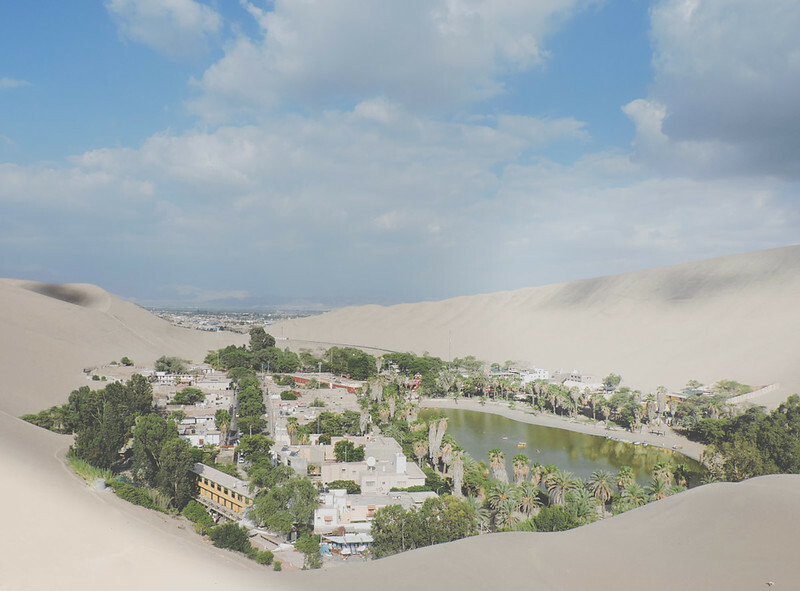 Huacachina (wha-ka-cheen-ah) is a town surrounded by sand dunes and by day you will hear screams of laughter echoing around the town. Those screams are coming from revelers who are taking a bumpy ride on the sand dunes. Usually, the dune buggy ride is packaged with sandboarding. Don’t worry, you don’t have to stand up if you don’t want to! Boarders can sit on their bottoms and use the board like a sled on the sand if they prefer. Don’t forget your action-cam for the ride. Other Activities: Close to Huacachina is the town of Ica wine which is famous for its vineyards where the local Peruvian drink, pisco is made. The main reason people visit Peru is to hike to Machu Picchu but this is not the only trail worth tackling. 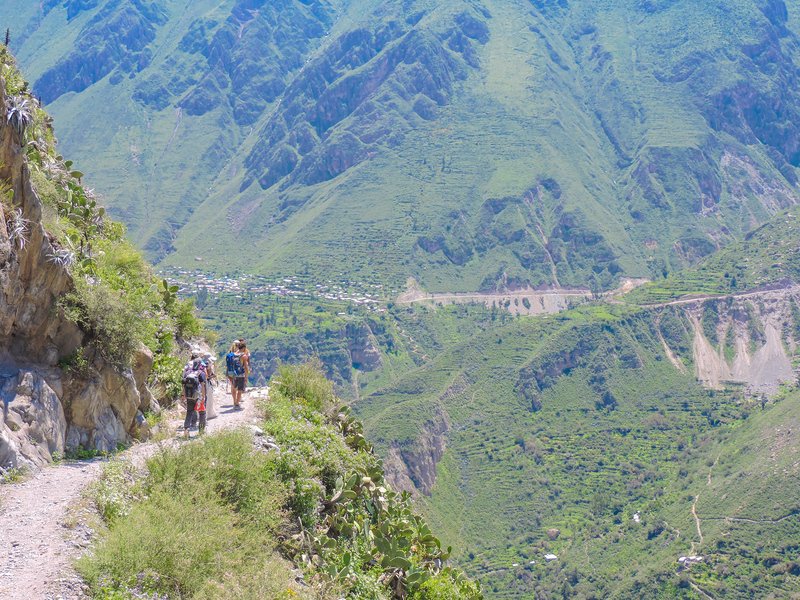 Peru’s Colca Canyon is a canyon 3400 meters deep and home to the famous Peruvian condor bird. This large winged beast soars above trekkers as they walk the two or three-day hike in, around and out of the canyon. The views are honestly the best I experienced in Peru, well worth pausing your trip at Arequipa for. There are many ways to reach Machu Picchu but the only one for the adventure lover is the Jungle Trek. 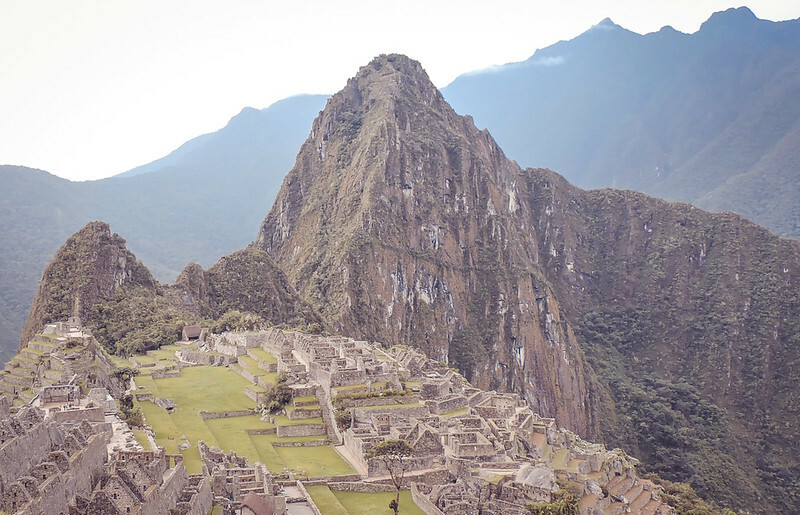 Thrill seekers bike, raft and hike their way to Machu Picchu Pueblo then visit the ancient Inca town on the last day. What to pack: long and short trousers, layers (it gets cold at night), raincoat (it rains! ), decent hiking shoes, trainers. Ride through the Andes on the Peruvian Paso horse deemed the Cadillac of all horses! Tours can range from day trips to over one week for the horse riding enthusiast. Starting point: Cusco, acclimatization is recommended. Tucked away in the Andes Mountain Range you will find Huaraz, a small town but active gateway to one-day and multi-day hikes. Popular treks include the very instagrammable Laguna 69 and 12-day Cordillera Huayhuash (not for the fainthearted). Like all Peru hikes, you must acclimatize before setting off. Starting point: the town of Huaraz. 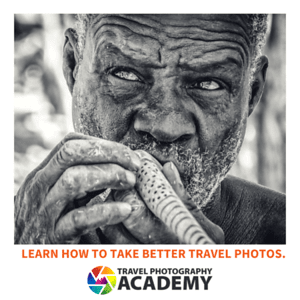 What to pack: well-worn hiking boots, waterproofs, layers, coca leaves. The Sacred Valley is full of adventure activities. Travelers can try out zip lining which starts with a short hike (under one hour) than flights over seven different cables. The full event takes around 5-6 hours. What to pack: closed shoes like light trainers or walking boots (no sandals), a light coat and a water bottle. Ride the Urubamba River on a raft with a trusty team for one day. Alternatively, if you are not short on time you should check out the multi-day tours some of which last for nine days straight. Rafters explore the Tambopata Candamo Natural Reserve which is close to the Bolivian and Brazilian border and rides Peru’s famous Lake Titicaca. Normal travelers take a bus and boat ride from Puno to Peru’s famous Floating Islands of Uros but adventure travelers are not normal. The alternative is to work those guns and take a kayak ride over Lake Titicaca to the islands made of reed. Duration: 4 hours (8 am pick up, returning to accommodation by 11:30). What to pack: sports gear, water gear, and safety vests will be provided. If you love animals with your adventure travel, head to the Peruvian side of the Amazon. The rainforest is accessed by Iquitos, the largest city in the world which can’t be accessed by road (the most efficient route is by air but there is the option to take a boat too). Visitors can spend time with the Yagua tribe in the Iquitos region and see the only ‘true’ Amazon River. If you are on a budget, you might want to try the cheaper alternative – a bus journey from Quillabamba. Visitors typically stay in a jungle lodge during their time in the rainforest. Getting there: by flight or by bus. Notes: there are shady companies that operate trips to the Amazon, research well before booking. What to pack: mosquito repellent, waterproofs, hat. Peru trips are exhilarating! There’s an abundance of adventure activities for travelers to try and thanks to its variety of landscape there really is something for everyone regardless of age, type of travel and budget. The biggest adventure in Peru is being on an inter-city bus. Thanks for letting us share the wild side of Peru, Gary!